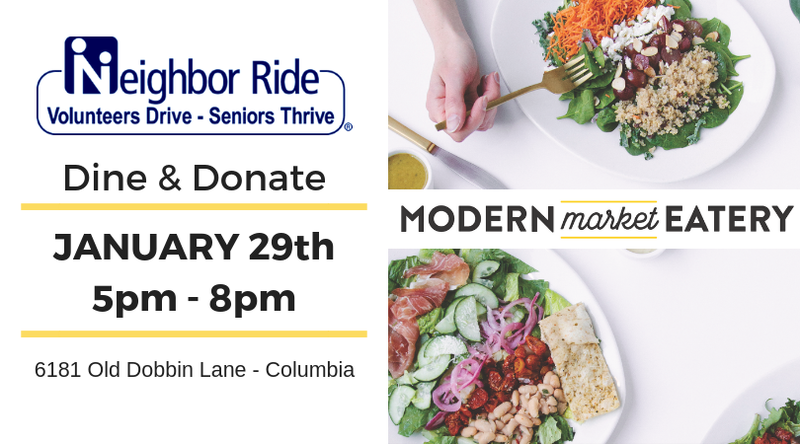 Just mention Neighbor Ride when you dine in or place a take out order in the restaurant and 50% of your bill will be donated. Online/Web/DoorDash orders will not count. Ways to Help Our Biggest Fundraiser of the Year! Saturday, May 4th at FOP Lodge 69, 2832 Nine Mile Circle, Catonsville, MD 21228. Doors open at 6:00 pm - Games begin at 7:00 pm. Is your New Year's Resolution to reduce clutter? DONATE unused gifts or gift cards or extra bottles of wine and liquor for our prize baskets. FEELING CREATIVE? Put together and donate a themed prize basket(s) valued at $125 or more yourself. LIKE PLANNING EVENTS? Join our Bingo Planning Committee . Contact Colleen at community@neighborride.org or (410) 884-7433 to donate or get involved with this annual fun event. We recently emailed each driver a log of all of their rides for 2018. If you did not receive yours please contact us. 331 drivers completed 8,855 rides! We had 76 drivers who drove over 25 times, 37 drivers who drove 50 or more rides, 10 drivers who drove 100 or more rides and 2 drivers who drove almost 300 times! Wow! "Your service provides a feeling of community, a 'small town' feel where neighbors help neighbors." 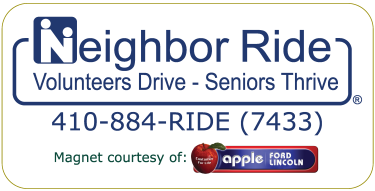 "I let each person know how much I appreciate them and the service of Neighbor Ride."